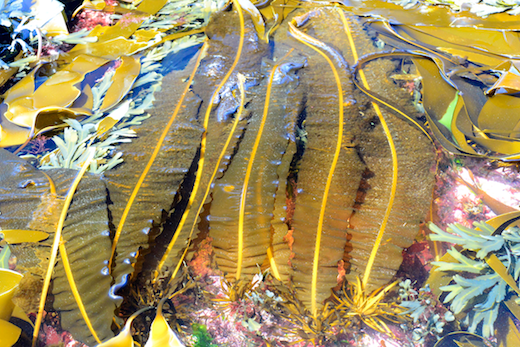 Description: Plants with olive or yellow-brown fronds to 4 m long and 25 cm wide, more often about 1 m and 7.5 cm wide. Attached by a root-like holdfast at the base from which a narrow flexible stipe arises which continues into the leafy part of the plant as a distinct mid-rib, generally with a yellow-brown colour (above). The reproductive structures, apparent as dark-brown areas, are confined to unbranched leafy appendages borne on the stipe, usually in two rows. Habitat: Generally growing on rock in wave-exposed places, often forming a band at low water and in the shallow subtidal, but also occurring in tidal pools in the lower shore. 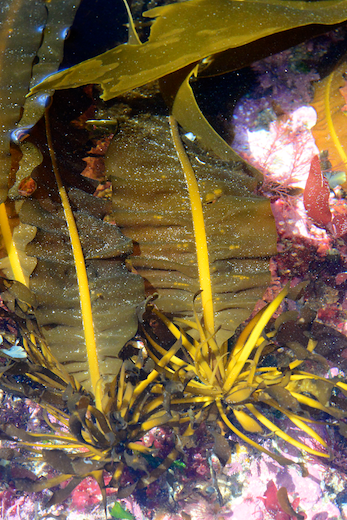 Distinguishing features: Two kelps in the NE Atlantic have distinct midrib: the introduced alien Undaria pinnatifida (currently on the S coast of England and NW France) and Alaria esculenta. In Undaria, the midrib is much more flattened and is more or less the same colour as the frond, and the reproductive structures are borne basally in a fluted structure. In Alaria, the midrib is more or less terete (circular in crossection), is usually a lighter colour, and the reproductive structures are borne at the base of the frond in special leaflets called sporophylls (below). Site © M.D. Guiry 2000 - 2019. Important copyright notice: all text, design and photographs on this site are copyrighted by M.D. Guiry unless otherwise stated and all rights are strictly reserved. Click here for copyright information and contact. Website design: 249 Design Studio. Site maintained by M.D. Guiry (michael.guiry@nuigalway.ie). There have been 8736680 page loads since 1 January 2014 on 25 April 2019.